Mirrors are basically a necessity, we can’t do without them. We are going to go through the best hand mirrors because every household should have one. The first mirrors were made using polished metal; brass, bronze, silver and even gold. In the 16th century, however, glass mirrors were made. The funny thing is that only rich people could afford to have one. We should be thankful for being born in this day and age, where we can readily get mirrors at throw away and affordable prices. We have mirrors everywhere, from our bathrooms, dining rooms, and bedrooms. Some people even prefer using mirrors as decorative pieces. Male or female, everyone should especially keep a hand mirror close by. Being mindful of our appearance is good for us since we get to be more presentable. We even become more confident to face people, after we reassure ourselves that nothing is out of place. 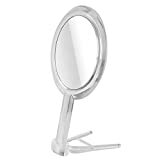 It this review, we have selected a variety of the best hand mirrors. We have made sure that different types of individuals will be able to get something from the options provided. The purpose: What do you often use your mirror for? This might sound like a strange question since we obviously use mirrors to look at ourselves. Ladies may want one they can use to apply their makeup, while a guy may want to shave and some people may just want to have a quick look. You will be in a better position to choose one, after figuring out what exactly you need the mirror for. The mirror size: Some people move around with their hand mirrors. The size of the mirror is determined by where you intend to place it. It should fit perfectly in your bag or even purse. The design of the mirror: some hand mirrors are decorated, while others are basic in appearance. Buy one based on your personal preferences. If you are getting one as a gift for someone, there are varieties you could choose from as well. The first time I came across this hand mirror, was on my nieces birthday. This is one of the best gift options you could go for. The gift set even comes in a very nice box. Each of the antique mirrors from Alice is very unique. 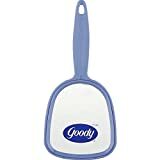 The mirror measures approximately 5″ L X 2.5″ D, while the comb that comes along with it is about 4.75″ L. Their sizes make them very convenient to travel with. In fact, they can even fit in a makeup bag. If you don’t want to carry it along with you, the set looks beautiful as a dressing table addition. Their intriguing antique features will make them stand out as decorative pieces. They were made of plastic and zinc alloy and will last you for some time. The gift box measures about 6″ by 4.5″ by 1″. They can be used by anyone above the age of 3. At number 9 we have another hand mirror that is also antique. It would look very stunning on your dress table. What makes it stand out is that its back is of a beautiful peacock king spreading its tail. 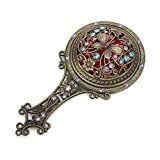 The hand mirror is made of metal and hand painted by craftsmen. The color matching is really attractive. You will love how it will fit in with your retro apparels, makeup, and bags. You’ll have the option of folding and unfolding it, based on your current needs. Your mind will be blown away, once you see, it’s very elegant wine red jewelry box packing. It is something you need to consider the next time you go gift shopping. When unfolded, it measures 10.2″ x 5.1″ OR 26 cm x 13 cm. The handle has a nice grip to it. 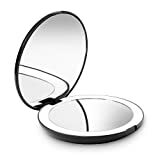 Beautify Beauties offers you a makeup tabletop mirror, which can also be handheld. It is portable and can be used even when you are not close to any table tops, especially while traveling. You will be able to easily rotate it, either horizontally or vertically. The mirror has the capability to swivel back, forth and sideways up to 180 degrees. LED lights are built around it, which come in handy when the lighting is poor. You can turn the lights on and off using a sensor or touch button. The on and off buttons can also help in adjusting the light the zooming or spot mirror can be removed. You can use it while holding it, or place it on any position in the mirror. The removable mirror has a suction cup. The mirror can highlight your entire face perfectly. This purchase will get you 4 mirrors from Goody. They have a very neutral look to them, so they can easily suit any gender. The mirrors are very light but they are built to last. They serve as great travel companions since they are about 8-1/2 in. L x 4 in. W in size. You can get them in a variety of colors, depending on the stock available at the time. The mirror is about 4 in. L x 3-1/4 in. W, without the handle. They are designed for everyday use. If you want a sleek looking hand mirror, then take a closer look. It has a slender yet soft touch to it and is reliable when it comes to functionality. The clarity you will get is impressive since it was constructed using DFP glass. It is distortion free and comes in a sophisticated black frame. This hand mirror is great for individuals who are ever busy and on the go. The black frame easily blends with décor. It has a slender handle. 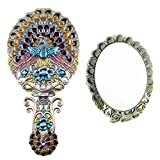 Both sides of this hand mirror can be used. One of the sides is perfect for things such as tweezing, applying makeup and such. This is because it has 7 x magnifications. The other side of the mirror is just regular and can be used for whenever you need a quick check. The mirror was made using highest quality optical glass. 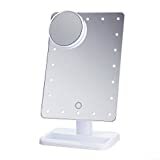 It can also be used as a free stand mirror. It comes with a clear frame. Oak leaf’s hand mirror has a chrome finish, to act as a barrier from moisture and condensation. This is part of why it is durable. It has 5 x magnifications and has been designed to occupy the least space possible. The mirror is actually two-sided and its classic design adds elegance to the room. It has also been designed to swivel. It is 6 inches in size. Fancii offers a compact solution for those who are mindful of storage space. The hand mirror is two-sided, and is about 5 inches in size. It has Led light bulbs which help emulate natural sunlight. The advantage to this is the fact that the results will be true-to-life, color-correct details. These lights will last for 20,000 hours. The mirror has a glossy black finish. The second position goes to another compact hand mirror. Studio ZONE offers you a two-sided solution, with one being regular and the other having 10X Magnification. Apply makeup, tweeze, or do blemish control, without struggling. The hand mirror is very elegant because of its sleek design. It is made from lightweight plastic. Sayard surpasses all the hand mirrors today, to come out at the top. The mirror is powered by 3 x AAA batteries to produce, natural white LED light. This is what makes it able to reflect true colors. It has been designed such that the surrounding light won’t cast shadows. Since it doesn’t have any cord, you can place it wherever you find suitable. It comes with a 100% No-Hassle Money Back Guarantee. You will get 10 x magnifications. 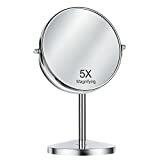 The Sayard 10X Magnifying hand mirror is not average in any way. Aside from the LED lighting, it also has a 360° swivel joint and an easy-Lock suction mechanism, that contribute to its performance. 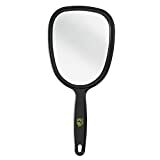 Buy one today, and you will understand why it leads the top 10 best hand mirrors in 2019.